At the conference “Towards user-centric transport in Europe — Challenges, solutions and collaborations” on May 22nd/23rd 2017 in Brussels, stakeholders discussed and developed ideas regarding their expectations, future fields of action and concrete measures for the European Transport and Mobility Forum within a crowdsourcing game. Participants wrote down their ideas, discussed them with other stakeholders and scored the ideas of others. A summary of results is presented below. The idea of establishing an interdisciplinary network through the European Transport and Mobility Forum has been of particular importance for the participants of the conference and was therefore highly rated. 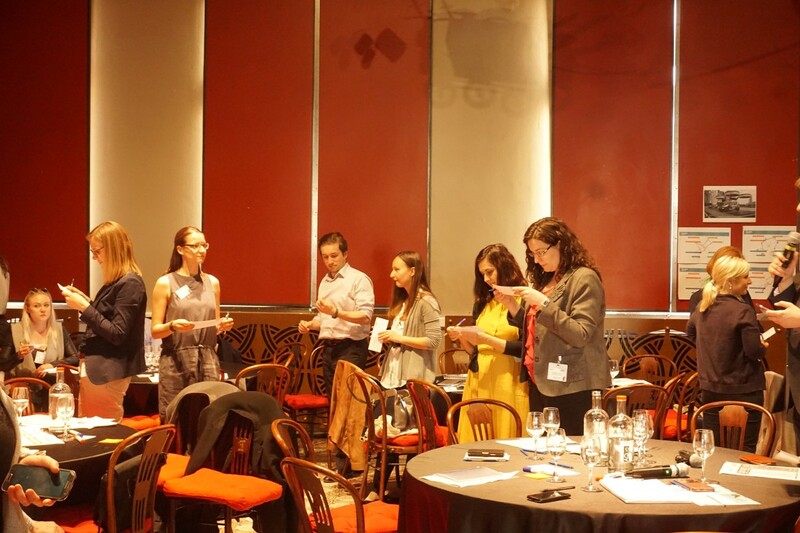 The participants expressed the need for a network “[…] in which different stakeholders (and users!) 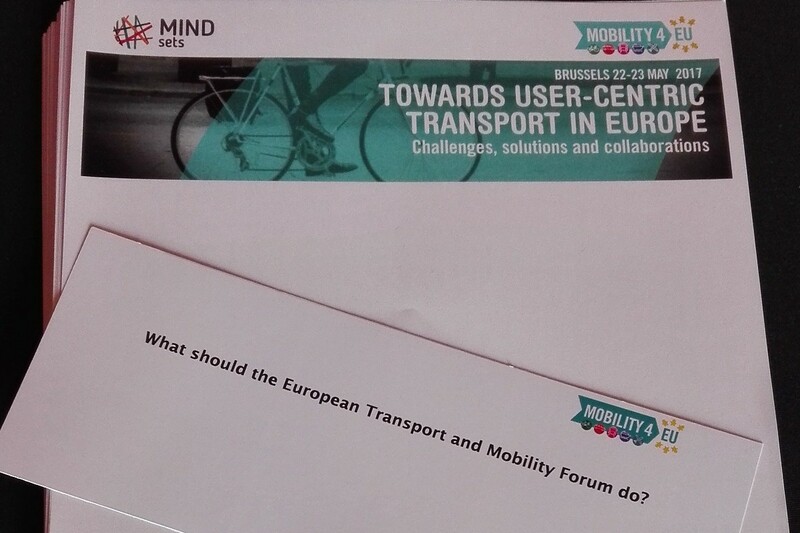 can exchange knowledge, ideas & experiences on mobility issues in Europe”. Furthermore, they acknowledged the value of a bottom-up participation process and the inclusion of a high representation of stakeholders from different specialist and non-specialist backgrounds (e.g. industry, research, users, logistics provider etc.) in order to contribute their individual experiences and knowledge to the network. The tasks of the European Transport and Mobility Forum determined by the participants range from facilitating discussions on key transport problems & solutions in the EU, to defining frameworks and examining new approaches such as annually awarding innovative concepts and ideas on the topic of mobility with a prize. On the part of the forum, providing an adequate interface between operators, developers and users was also assessed as an essential element to enable a wider exchange and discussion of experience and expertise among different stakeholders as well as the further development of “[…] strategic agendas for Research & Innovation with respect to users’ needs”. The participants considered the inclusion of needs, opinions and everyday experiences of users as the basis for the work of the Forum. Therefore it is considered necessary to integrate and harmonize the variety of technical languages used by the different stakeholder groups and create a common ground. Likewise a diverse selection of users from urban regions as well as rural areas should be invited to collaborate and discuss. These valuable insights into the users’ perspective could then be incorporated directly into the work of stakeholders and the public debate on mobility in Europe. Enhancing the public discussion and presenting the needs and preferences of various transport users may influence the EC’s priorities of EU transport research and enforcement of future mobility trends and actions. Conclusively, transparently presenting best practices and contributing to the establishment of an efficient legislative framework is of high practical relevance. On the one hand, this is to be achieved through (coordinated) co-operation and partnerships with cities, institutes and, in some cases, already existing initiatives (e.g. the “European Urban Agenda”) and on the other hand through practical testing under real-life conditions and in seminars or educational programs.